I was scheduled in my plan to do an easy run on Tuesday but it didn't happen.You know what they say about, mice, men and plans. Eventually Edel and I managed to team up and get out together on Thursday morning. Getting out together just doesn't happen too often as it usually involves babysitters. It was just a basic run at an easy pace nothing too dramatic. We did the first 7.5k as a steady loop and I dropped Edel off near home. 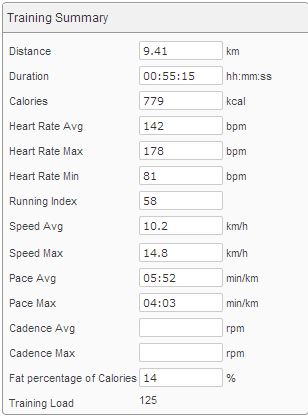 I went on to do another 2k with the last kilometer being fast. I'm thinking it would do no harm to throw in the odd hard km as if it is the finish of a race. Get the body used to finishing hard when tired.